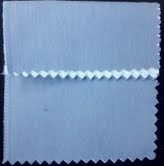 Sterling Silver Jewelry Cleaner Cloth. Gentle on gemstones because cleaner is in dry state. This is a wonderful maintenance cloth! If your Sterling is beginning to tarnish with browning or speckling, you may need something more concentrated such as Hagerty's Spray Sterling Cleaner, which is also available.